Nick Kyrgios was at it again. 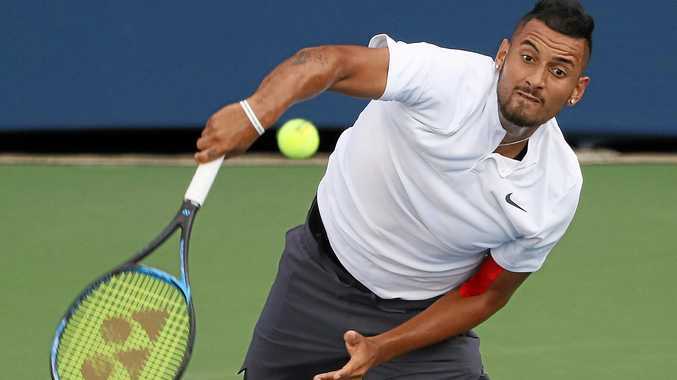 NICK Kyrgios overcame the embarrassment of forgetting his tennis shoes to battle through to the second round of the Cincinnati Open with a three-set victory over American qualifier Denis Kudla. The Australia No.1 held up the start of play as he was seen searching his kit bag on court before admitting to officials he hadn't packed his trainers. "Wait, what?" Kyrgios could be heard saying on camera as he went through the various compartments of his tennis bag before swearing when he clicked on to what had happened. After walking around the side of the court in his dark grey socks to find someone who could retrieve his shoes, the embarrassed world No.18 then told his bemused opponent: "I left my tennis shoes in the locker room, sorry man." But after a tournament aide came to the rescue by retrieving his required footwear from the locker room, which meant he didn't have to play in the basketball shoes he walked on to court in, last year's tournament runner-up wrapped up a nervy 6-7 (7-2) 7-5 7-6 (9-7) victory. The mercurial Kyrgios again produced some dazzling shots but also fired 39 aces, including a huge second-serve ace when down at match point as he saw off his battling opponent, who was fresh off reaching the quarter-finals at the Citi Open. Despite his win, there were concerns for Kygrios, who showed signs of being troubled by injury as he secured a showdown with Croatian Borna Coric, a 6-2 6-3 winner over Russian qualifier Daniil Medvedev. Australian Open semi-finalist Hyeon Chung of South Korea won the last five games to beat American Jack Sock 2-6 6-1 6-2. Sock has now lost eight straight matches since winning in Rome on May 13. Two-time Cincinnati semi-finalist Milos Raonic of Canada advanced with a 6-3 6-3 win over Serbian qualifier Dusan Lajovic. Germany's Robin Haase also made it to the second round, defeating another Serbian, Filip Krajinovic 4-6 6-2 6-3.